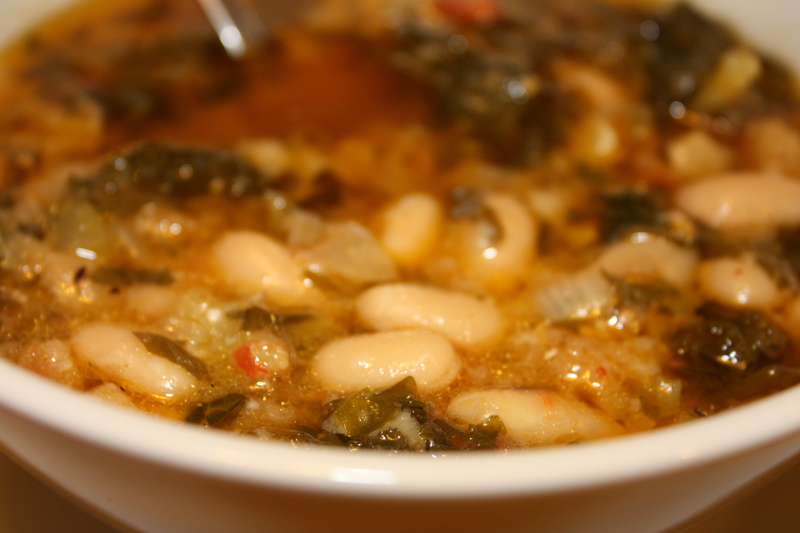 This bread soup aka ribollita is packed with flavor and is a great way to use up stale bread or leftover stuffing or dressing. The recipe comes from Tamar Adler’s An Everlasting Meal, one of my favorite books to read from and cook from! I used canned cannelini beans but you could use chickpeas or cranberry beans or really any decent sized bean probably. She says it’s a “less than authentic” ribolitta but it tastes fantastic. You can keep Parmesan rinds in the freezer until you need them. Just pop them in a freezer bag every time you cut the rind off your cheese. I use pieces about an inch long. You want to use a plain bread, not one with fruit or nuts or seeds. I used some leftover ricotta chive bread and some leftover dressing from Thanksgiving to make this. It was fabulous! And leftovers reheat well. If your leftovers are really thick, Adler says you can form it into little pancakes and fry them in (more) olive oil. Mine wasn’t quite that thick but that sounds delicious. 1 bunch chopped leafy greens kale, Swiss chard, collard greens, etc. 2 cups cooked beans (cranberry beans, cannellini beans, chickpeas, etc. 2 cups broth broth from cooking beans, chicken broth, liquid from canned tomatoes, etc. Heat 1/4 of olive oil in a soup pot and cook the onion, garlic and celery. Salt the vegetables lightly and cook until they start to soften. Add the herbs and chili flakes, then add the tomatoes, stirring to break them up as they soften. Cook about 4 minutes. Add the chopped green and the water, cover the pot and cook over low heat until the greens are wilted. Add the beans, broth and Parmesan rind. Bring to a simmer, then add the bread and 1/2 cup of olive oil. Cover, turn the heat as low as you can, and cook half an hour, stirring periodically. If it seems too dry when you stir it, add some more broth or water. As the bread absorbs all the liquid, it melts into the broth. Stir in another 1/2 cup of olive oil and remove the Parmesan rind. Serve warm, topped with grated Parmesan.